The notorious Ford Edsel is one of the most infamous failures in automobile history. Back in 1957, there was a huge publicity build-up toward the unveiling of this unusually styled 'mystery' car - a build-up that, sadly, was to end with a whimper and not a bang. Despite all the hype, promise, prayers and excited expectations of the auto-execs, the car proved to be one hell of a flop. Why? Well we've have to back to the beginning. By the 1950's, the Ford Motor Company was no longer owned exclusively by members of the Ford family; it had become a publicly traded corporation that sold cars in accordance with post-war market trends. The demographic-crunching market research guys were calling the shots and when they examined the market, they naturally took a long look at what the main opposition, General Motors, were up to. It was concluded that its own premier car, the Lincoln, was not effectively competing against the Cadillac. As the company was flush from the success of the Thunderbird, a decision was made to infuse the Lincoln with a more upmarket panache and to create a brand new model to fill the gap left in the Lincoln's former niche. The Edsel Company became a separate division of Ford and research for the new car began in 1955 under the working name the E car, to denote experimental car. It eventually became the Edsel in honour of Ford founder, Henry Ford's son, Edsel B. Ford. Before this, to drum up hype, the company had run a competition to choose a name and at one stage they even approached poet Marianne Moore, who came up with some weird and wonderful suggestions that the company wisely deemed were just a little too avant garde for the times. Some of Moore's eccentric suggestions included, Mongoose Civique, Resilient Bullet, Utopian Turtletop and the Varsity Stroke. The new design boasted a push button transmission, located in the center of the steering wheel, which was snappy but as this was the spot normally located for the horn, drivers found themselves accidentally shifting gears when they wanted to sound the horn. The Edsel also featured a combination rear-view mirror/front-view spotlight, along with a floating speedometer that glowed impressively when the driver reached a pre-set speed. The unusual tail lights were a boomerang shape and positioned in reverse. Basically it was a conventional car with some odd, distinctive features. 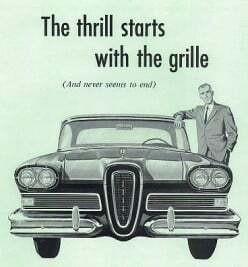 Roy Brown, the original chief designer on the Edsel project, had had a different vision for the Edsel, which included a slimmer, more refined opening in the center of the grill. However, the engineers had practical concerns about engine cooling problems and put the kyber on the original concept. In the new age of mass media advertising, the market promotion had more pre-production hype than Gone with the Wind. The ad campaign was large, widespread and intriguing because the public wasn't afforded a clear view of the impending car. 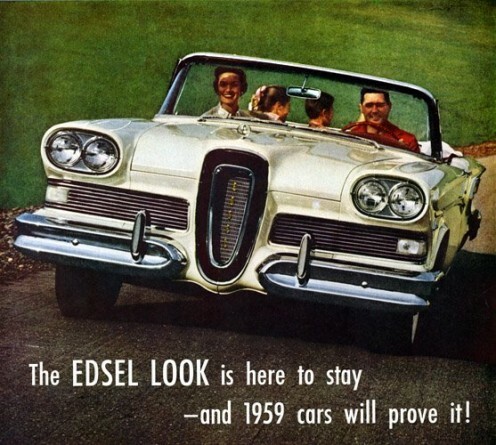 According to the hype, "there was nothing like an Edsel". Ford even teamed up with CBS to run a one hour special called The Edsel Show. Optimistically, Edsel had predicted sales of 200,000 cars a year, but it took the full three years the car was in production to reach that figure. Edsel B Ford must have been very disappointed with his name sake. Sept. 4, 1957 was E-Day...the day of the great unveiling. Immediately the public didn't like it. The conventional body but unusual front with its vertical grill and elongated inner loop was described variously as looking like a "a toilet seat", a "horse collar", "women's private parts" and as Time Magazine put it most cuttingly of all, "an Oldsmobile sucking a lemon". 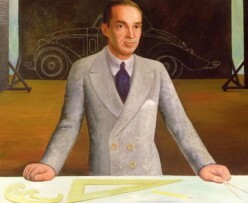 The unveiling of the new car was an anti-climax..the preceding hype about the mystery car had led the public to believe they were going to get something new and revolutionary. The Edsel had some nifty features but really, it was just comfortable old Uncle Joe wearing a Che Guevara hat. - nothing very revolutionary, nor spectacular.. 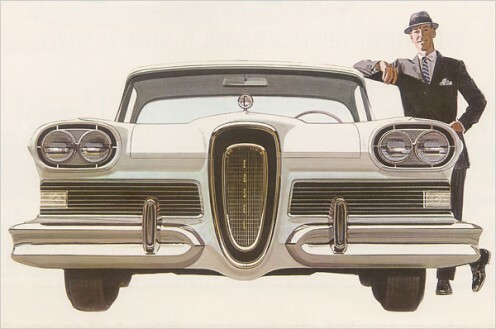 There is something distinctively awkward about the superficial design of the Edsel and in particular, its odd front. Perhaps there's some deep psychological reason why people rejected the aesthetics of it or perhaps it's just that it simply didn't look good - but whatever the reason, it failed to gel with public taste. Of course, in one of life's little typical ironies, the Edsel is now more sought after than its more successful contemporaries, produced in the fifties. No doubt, at the time of its production the Edsel did have some fans....although it was pretty much universally panned there are always those who swim against the flow. Just maybe there's still some undiscovered Edsels, lovingly preserved by Grandpas, in garages somewhere.